For inexpensive Japanese food in Cambridge, I often stop by the Asian food court in the Porter Exchange, located in Porter Square. You'll find seven Asian restaurants there, as well as an outpost of the Japonaise Bakery (though it is currently temporarily closed), Six of those restaurants are small, generally with less than ten tables, and during busy hours, you might have to wait a short time in line. However, the food is worth the wait, cheap and tasty. Often, I opt for Tampopo, which has a diverse menu of options, including excellent Tempura, moist Chicken Kara-age, ample Rice Bowls, and more. Recently though, I saw a review, by Marc of Boston's Hidden Restaurants, which mentioned Tan Tan Men at Sapporo Ramen at the Porter Exchange. His photo of the dish looked appealing and intrigued me enough to check it out. I've now eaten the dish twice, and it was consistently delicious each time. 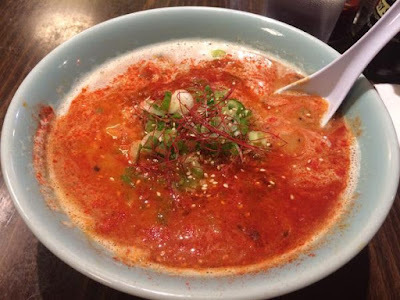 Sapporo Ramen is a Japanese noodle house which specializes in ramen, noting that "Our broth is made from chicken and fresh vegetables boiled over high heat for more than 10 hours and served with premium wave noodles." You can order their House Ramen, Miso Ramen, Soy Sauce Ramen, Curry Ramen, Vegetarian Ramen and more, with most options costing under $10. With your ramen, you can choose a number of options, for a small additional fee, such as extra noodles, ground pork, extra veggies, extra seafood, a butter cube and more. You can order a few appetizers as well, from Gyoza to Shumai, and a few other entrees, sich as Kara-Age or Katsu. I opted for the Tan Tan Men (pictured above), a sesame flavored soup, with wave noodles (thick egg noodles), and topped with spicy ground pork & scallions. This dish is a Japanese version of Dan Dan Noodles, aka Dandanmian, a specialty of Sichuan cuisine. Dan Dan noodles are also known as "peddler's noodles" and the term "dan dan" refers to a "carrying pole." Peddlers used to carry the pole with baskets for the noodles and sauce. They were a cheap and popular street food. Basically, the dish consisted of a spicy sauce over noodles, and may also have vegetables and minced pork. Somehow, when the dish was adopted by the Japanese, sesame paste was often added to the dish, helping to mute some of the spicy heat of the original Sichuan dish. If you search online for Tan Tan Men recipes, you'll find plenty of variations. At Sapporo Ramen, the dish is basically just soup, noodles, ground pork and scallions without any other veggies or seaweed. That doesn't mean though that it is light on flavor. It is a rich and savory soup, with spicy heat, nutty accents, and plenty of umami. Each sip of the soup bursts with complex flavors. The ground pork adds a meaty element, and helps to boost the umami, while the noddles add some firm texture. The bowl is large and hearty, and you might even need to take some home with you if you don't finish it all. It's worth visiting Sapporo Ramen just to enjoy Tan Tan Men, though I'm sure you'll also want to check out their other Ramen dishes. 1) Opening on Saturday, May 30, the new BISq (Bergamot Inman Square) is coming to Inman Square. "BISq will focus on eclectic small plates, an innovative charcuterie program and a compelling beer and wine list selection." The team behind Bergamot, one of my favorite restaurants, is introducing this 49-seat restaurant which will also feature two bars; one with a charcuterie bar and the other a beverage bar. BISq and Bergamot’s Wine Director, Kai Gagnon, has created a thoughtful and inventive wine and beer program to perfectly compliment the diverse cuisine that will be developed by BISq Executive Chef Dan Bazzinotti. Chef Bazzinotti will oversee the kitchen at BISq as the Executive Chef with Chef/Owner Keith Pooler also sharing his time between both locations. Kai plans on utilizing his sabrage skills at BISq on certain nights to commence service. The featured wines that Kai will be including on the wine list include those of Northern France, Germany and Austria. A majority of the wine list will focus on the Loire Valley. The BISq menu which has been created by Bazzinotti includes small plates with a focus on his charcuterie program. Some of the charcuterie menu highlights will include: creole calf liver mousse, chicken rillettes, kabanosy, and betty’s mazzafegati. Some of the menu standouts include: lemon corzetti, lamb ribs, green gazpacho, grilled nectarines, and creole beignets. The dessert menu, prepared by Bergamot Pastry Chef Kelcey Rusch, will have a daily selection of individual trifles. There will be three options nightly- one with chocolate, one with fruit (such as the orange-vanilla pudding with ramazotti soaked cake and toasted almonds) and one that has an eggy base. .I'm very much looking forward to checking out BISq. 2) The Legal Sea Foods in Cambridge’s Charles Square is lining up special summer eats, from June to August, at its expansive al fresco Terrace Bar situated in front of the Charles Hotel. 3) On Tuesday, June 16, at 6:30pm, Legal Sea Foods in Park Square will host a wine dinner with Leeuwin Estate. Leeuwin Estate is one of the founding wineries of the now famous Margaret River district of Western Australia. In 1972, legendary Napa Valley winemaker, Robert Mondavi, first identified the future site of the Leeuwin vineyard as being ideal for the production of premium wine and provided early mentorship to Denis and Tricia Horgan who founded Leeuwin Estate in 1974. Maintaining a team of highly skilled and dedicated winemakers, Leeuwin Estate is currently under the direction of two generations of the founding family and continues to churn out world-class wines with distinct flavors. 4) On Wednesday, June 10, from 6:30PM to 8:30PM, the Wine ConneXtion, located in North Andover, invites guests to explore the tastes of American bourbons and whiskeys, at its complimentary “All American Spirits” tasting. At this special tasting the experts at The Wine ConneXtion will be pouring a selection of upscale American bourbons and whiskeys barreled in the USA including one from Boston’s own backyard. Names such as Whistle Pig, Eagle Rare and South Boston Irish Whiskey are just a few of the great spirits to be poured at this tasting. Tastings are complimentary and open to the public, 21+ only. I was at their last whiskey tasting and it was an excellent event with plenty of delicious whiskey available to sample. This event should be just as good so check it out. 5) After 17 years in business, Chef/Owner Deborah Hansen of Taberna de Haro, in Brookline, has decided to open on Sundays. She will serve Brunch every Sunday from 12pm-4pm and then their regular menu from 4pm-8pm. Brunch sounds like a great idea and the menu is very compelling. Tortilla española, jamón serrano, manchego cheese, sliced tomato, warm baguette with olive oil - make a bocadillo! 6) Chef Jacky Robert, French-born and often considered a standard-bearer for French cuisine, recently sold his shares in Petit Robert Bistro and is bringing his enthusiasm and experience to a new venture. He has partnered with Ms Sam Sosnitsky, owner of Pierrot Bistro, a Beacon Hill restaurant, and on Monday, June 1, the pair plan to to re-christen the lower Cambridge Street space Ma Maison Jacky Robert. For Robert, its a homecoming of sorts, as he acted as consulting chef when Pierrot Bistro opened in 2004. Chef Robert promises that the menu at Ma Maison Jacky Robert will remain faithful to the precepts of classic French cuisine, while injecting an occasional element of surprise. 7) On June 3, starting at 6:45-pm, Puritan & Co. Chef/Owner Will Gilson, Chef de Cuisine Alex Saenz, Wine Director Peter Nelson and the restaurant’s team pay homage to Umbria’s wines from the “Green Heart of Italy” in the next installation of “Wine Wednesdays.” Wine Director, Peter Nelson, is working with Mise Imports to select six Umbrian wines to feature at the next wine dinner on Wednesday, June 3. Umbria is known as “il cuore verde d’Italia,” the green heart of Italy. I was at their last wine dinner and it was an exceptional time, with lots of great food and wine. This event also should be equally as good. 8) On Wednesday, June 3, at 6:30pm, experience some of Hell’s Kitchen’s famous (perhaps more aptly put, infamous) plates as Chef Brendan Pelley, of Zebra’s Bistro and Wine Bar in Medfield, cooks and dishes on his Hell’s Kitchen Experience. Chef Pelley didn't win but I'm sure he has plenty of fun stories of his experiences. The wines of Argentina and Chile are already fairly well known to wine drinking consumers. Uruguayan wines are just starting to gain entry through the door, impressing those wine lovers who have tasted them. Brazilian wines have just started knocking at the door so what will you find if you open that door? You probably would be surpassed by the scope of the Brazilian wine industry, with about 84,000 hectares of vineyards and over 1100 wineries, most which are small. The history of wine production extends back to 1532, when vines were brought from Madeira, though the initial vineyards fared poorly due to the hot climate. The environment would remain a constant challenge and most of the vineyards are currently located in the southernmost region of Brazil, away from the equator. About 8 years ago, I tasted my first Brazilian wines at a Brazilian rodizio restaurant and I very much enjoyed a red blend. Since then though, I've had Brazilian wines on only two other occasions, including at another rodizio restaurant, though both experiences were pleasant. I rarely see their wines available at any wine store so I'm sure most people have never tasted a Brazilian wine. I recently received a media sample of two Brazilian wines from Vinicola Salton, including a sparkling wine and a Tannat. Vinicola Salton was founded in 1910, but its roots extend back earlier, when Antonio Domenico Salton moved from Italy to Brazil. He settled in the Italian Dona Isabel colony in Rio Grande do Sul and was an amateur winemaker. His sons, Paulo, Ângelo, João, José, Cézar, Luiz and Antônio, started Paulo Salton & Irmãos, growing grapes and producing sparkling wine and vermouth. Salton, which is now the oldest, continuously operating winery in Brazil, remains a family business and sparkling wine is still their specialty. The Salton Intenso Sparkling Brut ($15-$17) is a blend of 70% Chardonnay and 30% Riesling that was produced using the Charmat method. With an alcohol content of 12.5%, the bubbly had an appealing nose of floral and citrus notes. On the palate, it was dry with a nice acidity, flavors of green apple and pineapple, and a mild creaminess. Very clean flavors, a moderately long finish, and with plenty of character for the price. It would be a good food wine, and is a nice option at this price point, rather than many of the sweeter sparkling wines you often find at this level. If this is a representative sample of the potential of sparkling wine in Brazil, it would be great to see more of it available in the U.S. I've tasted dozens of Tannat wines from Uruguay, so my personal bar for Tannat wines is high. I've seen its potential, at all price points, so I was curious to taste a Brazilian example. The 2013 Salton Classic Tannat Reserva Especial ($10-$12) is made from 100% Tannat, aged for a short time in American oak. With an alcohol content of 13%, the wine was a dark red in color with an aroma of chocolate and black fruit. On the palate, it is a bit rustic, with moderate tannins, and flavors of chocolate, blackberry, black cherry and some herbal accents. This is a wine that would benefit from pairing with food, especially burgers and BBQ. It is a good wine, just not as soft as many Uruguayan Tannats at this price point, but that is merely a matter of preference, not quality. Let's hope we see more Brazilian wines coming to the U.S., to better explore their potential. 1) Vine Brook Tavern, located in downtown Lexington, has starting serving lunch Tuesday-Sunday from 11:30am-3pm. A creation of Marcus Palmer and Brian Lesser, Vine Brook is a contemporary American tavern offering classic, refined American fare, warm hospitality, and outstanding service. American cuisine and a blend of farm-to-table produce from local Lexington farms is the theme for Executive Chef Chris Frothingham’s menu. Vine Brook Tavern also offers an extensive selection of wines, craft micro-brews, and cocktails. Featuring over 20 mostly American wines, Vine Brook Tavern serves these wines through its custom cruvinet system at proper temperatures. With twelve beers on tap and twelve more in bottles and cans, Vine Brook Tavern features a wide selection of craft micro-brews as well as quality production lagers and ales. Of course, the spirits mustn’t be left out, which is why Palmer has enlisted some of Boston’s finest mixologists to create a fantastic mix of modern and contemporary cocktails. 2) Beginning May 18, Prezza will introduce a new pairing special at the bar and in the dining room that is available through June. Macaroni Mondays offers three housemade pasta selections for only $8 each on Mondays from 5:00pm-7:00pm. Chef Caturano’s featured pasta dishes include Tagliatelle with meatballs; Gnocchi with San Marzano tomatoes and basil; and, Orecchiette with sausage, broccoli rabe, chili flakes and parmigiano. For those looking to imbibe, Prezza will offer a trio of premium red wines by the glass that come paired with a complimentary order of one of the three “Macaroni Mondays” featured pastas. From the Prezza wine cellar, there is Beni di Batasiolo Barolo ($17), Francis Ford Coppola Director's Cut Cabernet Sauvignon ($15) and Castello di Monsanto Chianti Classico Riserva ($15). By popular demand, Chef Caturano is bringing back Crispy Shrimp Tuesdays for a limited time. Each Tuesday from 5:00pm-7:00pm at the bar and in the dining room, Prezza will dish out three U-10 Crispy Shrimp with Italian Slaw and cherry pepper aioli for only $8. For summer wine enthusiasts, Prezza will feature three premium white and rose varietals by the glass which will come paired with a complimentary order of the Crispy Shrimp: Chateau Miraval Jolie-Pitt Cotes de Provence Rose ($14); CADE Sauvignon Blanc ($15); and, Duckhorn Vineyards Chardonnay ($16). 3) On June 22, Red Sox Designated Hitter David Ortiz is bringing the flavor of his native Dominican Republic to Boston at the third annual “David Ortiz Children’s Fund Gala” hosted at the Boston Marriott Copley Place. Proceeds from the festive fundraiser will benefit the David Ortiz Children’s Fund, in partnership with MassGeneral Hospital for Children and the World Pediatric Project, which provides critical pediatric healthcare to children in New England and the Dominican Republic. Tickets now are available for the island-inspired soiree where revelers will have the opportunity to mix-and-mingle with Boston’s biggest names in sports and entertainment. Guests also will enjoy a Dominican-themed cocktail reception, live Latin music and entertainment as well as a three-course seated dinner – hosted by Big Papi himself – in honor of the special works and the beneficiaries of the David Ortiz Children’s Fund. All guests will have access to an exclusive silent and live auction featuring unique memorabilia and priceless experiences. HOW: To reserve tickets, please visit: www.davidortiz.splashthat.com. Tables and sponsorship opportunities are available by contacting Radegen Sports Management’s Alexis Walberg at 212-727-2142 or AWalberg@radegen.com. 4) In honor of the seasonal opening of Fiorella’s outdoor patio, the restaurant is encouraging people to celebrate sun, family and friends on Tuesday, May 26, from 11:30AM – 4PM as it hosts a special day of delicious food and libations and beautiful weather. Guests to Fiorella’s can treat friends and families to a complimentary lunch entrée courtesy of the restaurant with the regular purchase of any entrée. “We want to welcome our neighbors, friends and essentially our extended family back to a summer full of amazing outdoor dining. We have a lot of amazing events planned for our patio including special wine dinners, tastings, and receptions. We’re looking forward to welcoming everyone back,” said Remon Karian, Owner of Fiorella’s. Guests can vie for dishes like Tilapia Cannellini featuring fresh tilapia poached with capers, tomatoes & cannellini beans prepared in a delicious lemon and wine sauce served over a bed of fresh spinach & rice pilaf ($14), or the Vegetable Chicken Salad with sautéed chicken and mushroom, zucchini, summer squash & broccoli over a house salad, topped with red onions, cucumbers & olives in a balsamic dressing ($10). Guests can also try one of Fiorella’s classic pastas, artisanal sandwiches, or enjoy one of its thin Neapolitan style pizzas cooked in a 700˚F wood burning brick pizza oven. The Priorat wine region of Spain receives plenty of accolades and media attention. Wine lovers often know about the region and its highly prized wines. Priorat wines though can be expensive, often making them more a special occasion wine. A lesser known wine region almost completely surrounds Priorat, and some of its wines can be similar to Priorat wines, but at much lower prices. This is the Monsant DO. The Monsant DO was created in 2001, though wine making in the region extends back to at least the ancient Romans. The region has about 2000 hectares of vineyards, and much of the terrain is mountainous. White and red grapes are grown, including Chardonnay, White Grenache, Macabeu, Cabernet Sauvignon, Carignan, Red Grenache, Syrah, Tempranillo and others. There are around 60 wineries in Montsant, and they export about 60% of their production with Germany being their top importer and the U.S. taking second place. I enjoy the taste of Montsant wines, and especially like that many of them are very affordable. At the Beacon Hill Wine & Gourmet in Melrose, where I work part-time, I recently purchased the 2013 Joan d'Anguera Altaroses ($17), and I enjoyed it so much I had to buy a few more bottles. The Cellars Joan d'Anguera is located in Catalunya, and the estate extends back approximately 200 years. Josep d’Anguera is famous for having introduced Syrah to Montsant, and since his passing, his sons, Joan and Josep, have taken over, though with the assistance of their mother, Mercè. Joan and Josep have moved forward to create their own style of wines. In 2009, the brothers transformed the vineyards to organic farming, as well as beginning the process to become Biodynamic. In 2012, they received their Demeter Biodynamic certification. Their wine production methods have also seen changes from the days of their father. For example, they only destem partially and mature their wines in much less new oak, choosing to use more older oak, foudres and cement tanks. In addition, they have focused more on Grenache wines, rather than the Syrah their father brought to the region. The first vintage of Joan d'Anguera Altaroses was in 2011, but the 2012 vintage was their first Biodynamic wine. The wine was crafted to resemble the traditional wines of the region, a lighter style of Grenache, and that is also why they chose to refer to the grape as Granatxa, the old Catalan term for Grenache. The grapes for this wine are about 15-40 years old and they were fermented in concrete vats using indigenous yeasts, It was matured for about 12 months in old oak barrels, and is unfined and unfiltered. The wine is light red in color, with a pleasing aroma of red fruits and spice. On the palate, it is light bodied but with a compelling melange of flavors of dark cherry and strawberry, rich spice, and an earthy undertone. Mild tannins, nice acidity, and plenty of elegance. It is an easy drinking wine, but with plenty of character, especially at this price point. With its light body, it would work well during the summer, from roast chicken to burgers. Highly recommended. Puritan & Co., located in Inman Square, is one of those restaurants that shows a true passion for wine. Sommelier Peter Nelson has composed an interesting and diverse wine list and on the first Wednesday of each month, he hosts a special Wine Wednesday event. A five course dinner, created and prepared by Chef/Owner Will Gilson and Chef de Cuisine Alex Saenz, is paired with five different wines specially chosen by Nelson. Each Wine Wednesday has a specific theme, and the number of available seats varies, though it generally is an intimate event. I was invited as a media guest to May's event, the Au Naturel Wine Wednesday, which showcased five natural wines. Twelve people attended this dinner, sitting at a communal table, including Jackson and Scott from Mise Wines, who supplied the wines and discussed them during the meal. Explaining why he chose the wines for the evening, Jackson stated he aimed for diversity in the wines, and also wanted wines that would represent Spring in France. Most of the wines were Biodynamic, and all were from small producers, each trying to produce more natural wines, with minimal manipulation. Overall, I was pleased with all of the wines, finding a few of them especially impressive, and the food was also delicious and satisfying, and paired well with the various wines. The intimacy of the dinner, getting to discuss and share these wines with others, was an added benefit. It was casual and fun, a tasty gathering which I would highly recommend to all wine lovers. My favorite wine of the evening was the first one we tasted, the 2011 Château La Tour Grise Chenin Blanc “Les Fontenelles,” (about $25). From the Loire Valley, this wine is made of 100% Chenin Blanc and has an alcohol content of 13.5%. The winery has two different parcels of Chenin, each which is treated the same, but as they have different terroirs, the wines are very different. This wine had an intense orange-brownish color, which will change to a more clear, yellow color if left decanted over night. The wine had a mild, funky aroma, a common element to most of these wines, though the aroma generally went away with some time in the glass. My palate was intrigued by the complex and intriguing flavors of this wine, from its strong minerality to its honey and apricot notes. Plenty of acidity, floral notes, a savory aspect, and more led to an impressive wine. The wine's umami aspect meant it would pair well with a variety of foods, and I wished I had saved some for the later course with the earthy snails. A killer wine which I highly recommend, and which I need to add to my cellar. Our first food course was a Chilled Sorrel & Buttermilk Soup with squid and zucchini noodles. The creamy soup had a nice mix of bright lemon and herbal flavors, with an interesting textures from the noodles. It made for a fine Spring or Summer dish, and went well with the Chenin. The second wine was the 2012 Roland Pignard Morgon (about $25), a fine Beaujolais. The winery owners are elderly, but still do everything themselves, by hand. It is also said by some that Morgon is the heart of the natural wine movement. With an alcohol content of 12.5%, this light red wine had plenty of delicious strawberry flavors with a mild earthiness. As easy drinking wine with character which elevates it over many simple wines. I usually prefer Beaujolais from Morgon so this wine appealed to me. Next up was a Sprout Salad with a mixed blend of sprouts, a fried poached egg and Burgundy snails. That egg was the star of the dish, with a delightful crunchy coating and that lush, gooey yolk. The earthy snails were a tasty treat as well, especially when slathered in some egg yolk. The Beaujolais went well with this dish, and I can see this wine pairing with many Summer dishes. The 2012 Jacques Maillet “Autremont Rouge” (about $27), has an alcohol content of 13%, and is from the Savoie region. The word "autremont" means "differently" and this wine is a blend of 45% Pinot Noir, 35% Gamay, and 20% Mondeuse. The producer, Maillet, once worked with a co-op which used chemicals in its vineyards. Maillet became ill and it took him three years to recover, leaving him with a determination to never again work with chemicals, which led to him making his small estate Biodynamic. This wine had an intriguing aroma, with strong floral notes but another elusive scent, something I couldn't readily identify but which seemed familiar. The wine was light bodied, with plenty of red fruit flavors, mild earthy notes, smooth tannins and floral elements. Avery pleasing wine with lots of complexity. This wine was paired with Black Bass with asparagus, Marcona almonds, and wheat berries. The flaky fish was complemented by the ground Marcona almonds, and the wheat berries added some nutty notes too. We moved onto the 2012 Domaine Ledogar Cinsault “Les Brunelles,” a wine (in magnum) from the Languedoc-Roussillon which is made from 100% 80-year old Cinsault, This wine had the strongest barnyard aroma though it settled down with time. On the palate it had a strong, earthy backbone with smooth tannins, tasty black cherry and raspberry flavors and a lingering finish. A compelling wine, this was also a great choice for the accompanying dish. The Crispy Skin Duck & Alliums, with ramps, vidalia, and scallion oil, was my favorite of the five courses. The large piece of duck was quite thick, cooked mostly rare, and was absolutely sublime. It was extremely tender, with crispy skin, and each piece just melted in my mouth. I'd order that duck again and again. The onion paste streaks were also tasty, with both sweet and savory notes. The final wine of the evening was the 2002 Château Le Payral “Cuvée Marie-Jeanne,” ($40) which has an alcohol content of 11.5% and is from the Saussignac region. Made from 100% Semillon that has undergone Botrytis, it is only made in exceptional years and will remind you of Sauternes. It is rick and thick, with good acidity, a balanced sweetness, and lovely flavors of honey, apricot, dried fruits and floral notes. A true treat. Dessert was a Frommage Blanc Panna Cotta which was made with sweet, red strawberries and some pickled green strawberries. The taste of the creamy panna cotta was enhanced by the sweet and sour strawberry flavors, with the pickled ones adding a very different, and tasty, aspect to the dessert. Compelling wines and cuisine, this Au Naturel wine dinner was a big hit, and the others at the communal table all seemed satisfied and pleased with all that we ate and drank. Seek out the wines from this dinner, and also make reservations for a future Wine Wednesday event at Puritan & Co. The next Wine Wednesday will be held on June 3. Diversity is important for all of us, helping to broaden our experiences, to open our minds to new ideas, and to eliminate our biases and prejudices. The person who only drinks Chardonnay would benefit from tasting a variety of other white wines. The person who only eats Italian food from the Olive Garden would benefit from dining at other Italian restaurants. Broadening the horizons of what you eat and drink opens you up to so many possibilities. The benefits of diversity concern far more than just food and drink. They touch on all aspects of our lives, and it is a topic many people have been addressing. It is a topic that can be controversial at times, but we should not avoid it because of that fact. We need to meet it head-on, to embrace diversity and cherish its positive aspects. Diversity will only make us better human beings. As a small contribution to this issue, I want to address one aspect of diversity, to showcase people of color who blog about food & drink. I previously highlighted women who blog about wine, and it was an extremely popular post (and also is due for an update). It helped to bring to the forefront all the valuable contributions and unique voices of these bloggers. We need to expand our scope and learn of the unique viewpoints from people of color as well. I've been blogging about food and drink in the Boston area for over 9 years, and the vast majority of bloggers I see at local events are white. I have spoke of this before, stating we need to find ways to attract more people of color to these events. An initial step would be to identify those people of color who blog, to showcase their talents. This could be a motivation for other people of color to get involved and start blogging too. It will also present blogs with different voices, a way for all of us to expand our own experience and knowledge. Initially, I would like to create a list of people of color who live in Massachusetts and blog about food and/or drink. In time,I will expand the list to people outside of Massachusetts but I want to start off small first, to make it a more manageable project. To create this list, I need help. I need local people of color to contact me about their blogs. Please send me the name of your blog, its URL and a brief description of what you write about. You can email me, message me on Facebook or contact me through Twitter. Once I have a number of entries, I will post a directory to these blogs, so that everyone can learn about these blogs and hopefully start following them. If you have any questions, feel free to add them to the comments or contact me directly. 1) Chef Brian Dandro at the Royal Sonesta Boston thinks the ultimate Patio Dining experience essentials are a water view with a sailboat or two on the horizon, a heaping lobster roll and a pitcher of Sangria on the table to share with good friends. With this vision in mind, Chef Brian has created a Summer Patio Party line-up at ArtBar, with special events happening every night beginning June 1. Sweet Relief Tuesdays – Pastry Chef Christina Allen-Flores will be creating S’mores, Lemon Panna Cotta, Key Lime Pie, Strawberry Shortcake as some of her summer confections. Dessert is compliments of the house on Tuesday evenings with the purchase of a sandwich, burger, or entrée. Beer & Burger Wednesdays – ArtBar is offering a special Wednesday burger at half price, paired with a beer of your choice. Trivia by the River Thursdays – Surrounded by the world’s leading universities, it’s time to show your smarts every Thursday night at ArtBar with Trivia Nght hosted by Stump Trivia. Show your trivia smarts and win delicious prizes. Lobster Fest Fridays – Chef Brian is creating an all-lobster menu to be offered on Friday evenings with special discounts out on the ArtBar patio. Dig your claws into twin lobsters, lobster bisque, lobster corn dogs, lobster rolls, lobster lettuce wraps, lobster pot pie, and more. Bibs optional. Saturday Sangria and Tapas - Summer = Sangria + Patio Dining. Chef Brian is creating a Summer menu of small plate favorites paired with authentic Spanish tapas. Buy a pitcher of sangria and get one item from the tapas menu free. Sunday Bloody Mary Brunch - Design your own Bloody Mary at ArtBar’s Bloody Mary Brunch. The ideal way to spend a Sunday afternoon on the patio. Table #30 – Looking for Summer’s Best Patio Table? Ask about Table #30 at ArtBar – it’s a corner table with great views of the Charles River. 2) Charlie Gaeta, the GM and Beverage Director at The Blue Ox in Lynn, has launched an intriguing new initiative for wine drinkers called ‘Throwback Thursdays.’ This is a play on the popular hashtag #TBT, and a way to engage their customers concerning older wines. Charlie is sourcing out wines with a considerable amount of age on them; wines that are essentially never poured by the glass but are generally cellared away or available only by-the-bottle at most restaurants. Every Thursday, Charlie hand-picks aged varietals (hence the 'throwback' terminology) that showcase specific grapes in specific regions that age well as a way of providing his guests the experience of drinking an older wine without having to splurge on the entire bottle. Because he tastes the wines prior to selling them, Charlie is able to ensure guests aren't just getting an aged wine; they're getting a unique and enjoyable wine experience. Typically, the #TBT offerings are served table-side by decanter, which includes having a conversation with Charlie about the varietal. A great producer with a decade of age on it. It showcases how white wines can age from the Northern Rhone. This is a blend of Marsanne & Roussanne. A great way to showcase the quality or old Napa reds. This was the oldest wine they have poured so far. I think this is a very cool program and recommend you check it out, to get to taste wines you might not normally have access. And The Blue Ox has excellent food to accompany these wines. 3) Chef & Owner Anthony Caturano is bringing new flavors to his weekly Gravy Sundays culinary series at Prezza in the North End. “Gravy Sundays” provides a menu of Old World-style comfort cuisine with a featured special each week. Prezza’s core “Gravy Sundays” menu serves up six homestyle options including: Fried Calamari (cherry peppers - $14); Gnocchi (San Marzano tomatoes, parmigiano - $18); Chicken Parmigiano (tagliatelle, San Marzano tomatoes - $26); Veal Saltimbocca (crispy prosciutto, broccoli rabe,, roasted potatoes - $26); Orecchiette (sausage, broccoli rabe, chili flakes, parmigiana - $18); and, Meatballs (tagliatelle, pecorino cheese - $18). 4) Beginning on Tuesday, May 19, Besito Mexican, at the Burlington Mall and The Mall at Chestnut Hill, will offer a new “Appy” Hour, Every Monday through Friday, from 3pm-6pm, guests can grab a seat in Besito’s bar area and take advantage of $5 appetizers and $5 tacos as an end-of-day treat. Tacos (2 each), including Tacos de Camaromes (shrimp), Tacos de Pollo Tinga (chicken), Tacos de Pescado, (fish), and Tacos de Carnitas (pork). Pinotage can be a polarizing grape, one that you either love or hate. However, I believe that much of the criticism is due to some poor examples from the past, and not a proper tasting of the wines that now are being produced in South Africa. I've long been a fan of Pinotage and was intrigued recently when perusing the wine shelves at the Beacon Hill Wine & Gourmet in Melrose (where I work part-time) and noticed a White Pinotage. White Pinotage? Red grapes can be used to make white wine as the color of wine is usually derived from the skins. If you press the red grapes quickly, and keep the juice away from the skins, you can obtain a "white" wine. That is a simple explanation for what can be a more complex process, but the important fact is to know that it is possible. The Mellasat Vineyards are located at the foot of the Klein Drakenstein Mountains in the Paarl region of South Africa. Some of the vineyards were once part of the Dekkersvlei farm, which was established in 1693. In 1996, Stephen Richardson, an Englishman with a deep passion for wine, purchased the property He replaced some of the pre-existing Chenin Blanc vines with Pinotage, and the entire vineyard is only around eight hectares. In 2007, Richardson chose to create the first barrel-fermented White Pinotage. No other winery appears to make a still White Pinotage bottling, though under South African wine law, it cannot be labeled as a "white wine" because it is made from red grapes. Instead, it must be labeled as "blanc de noirs." The grapes are "whole bunched pressed without de-stemming or crushing in a pneumatic “bag” press to minimise colour retention." They are fermented in 300 liter Romanian oak barrels (19% new). The wine spends about 11 months in the barrel with regular stirring of the lees. The 2012 Mellasat White Mellasat ($27) won't remind you of Pinotage and in a blind taste test, you would never guess the correct grape. With an alcohol content of 13.5%, I found it to be complex, intriguing and delicious. I have seen several sources say that it is reminiscent of Chardonnay, and I can see some of the reasons for such a belief, but I also think there are differences too which might get you thinking of a few other white grapes, from Melon de Bourgogne to Viognier. There is a certain richness to the wine, likely due to the time on the lees, but there is plenty of crisp acidity to balance this richness. That may bring to mind a fine Muscadet. There is an interesting melange of flavors, including tropical fruits and bright citrus, as well as a backbone of minerality. Well balanced and with a lengthy, satisfying finish, I loved this wine and feel the quality of the wine is worth the price. Even if you think you dislike Pinotage, you are going to enjoy this wine. It is unique and interesting, delicious and compelling. Seek out this South African treasure. What group of people is the most tired and beat today, making Monday an even tougher ordeal than usual? Yesterday was Mother's Day, a holiday where we honor one of the most important person in our lives. It was a day to treat our mothers, allowing them to relax and take a well deserved rest. We may have given our mothers gifts, such as flowers, chocolates, or wine. We may have taken our mothers out to brunch, lunch or dinner. In fact, some sources claim that Mother's Day is the biggest restaurant day of the year. However, we may not think about all of the restaurant workers who must work on this very busy holiday, workers who sacrifice their own time with their mothers so that they can serve you and your mothers. From servers to cooks, dish washers to busers, they work hard on this holiday, to try to make everything right. And I'm positive they also have to deal with some difficult customers, including even a few who won't be satisfied no matter what happens. As you enjoyed your holiday meal, you may have given little attention to all of the staff who tried their best to please you. I'm sure all of those restaurant workers were exhausted by the end of yesterday, and today, they are recuperating, resting up after such an arduous shift. They are probably the most tired group of people today, and some may even have to work today too. Yet who thinks about these restaurant workers today? All of their hard work from yesterday has been largely forgotten. As Mother's Day is the biggest restaurant day of the year, a day of great importance, then maybe the Monday after should be a day, even unofficially, to recognize the hard work of all restaurant workers. We chose to take our mothers out for dinner rather than try to cook it at home. We relied on all of those restaurant workers to impress our mothers, to make our mothers have a great day. So they deserve recognition for their efforts. Today, take some time to recognize these people. Give thanks to them. Spread the word about the restaurants you visited. Don't let them remain invisible after everything they did for you and your mother. 1) Mark your calendars for Sunday, June 7, from 3:30PM – 5:00PM as Beacon Hill Hotel & Bistro hosts “Sparkle VIII,” an event billed as “…an afternoon of fashion, food & fun.” The event will bring together people from around Greater Boston to sip cocktails, enjoy light fare and finger foods, and view the latest styles during an afternoon charity fashion show to benefit Rosie’s Place, a sanctuary for poor and homeless women. This year’s special guest hosts will be Erica Corsano, lifestyle editor and social columnist at The Boston Herald, and Jenny Johnson, co-host of NESN’s “Dining Playbook.” Modeling the latest summer fashions will be editors, producers, writers and on-air talent from some of Boston’s most prominent media outlets. Graciously donating their time to this year’s event will be: Nelly Carreño, meteorologist for NECN, Sean Donovan, social media maven aka “BostonMo,” Cheryl Fenton, freelance lifestyle magazine writer and Digital Editor for Boston magazine's Weddings, Jacqueline Houton, editor of The Improper Bostonian, J.C. Monahan, co-anchor of WCVB-TV's “NewsCenter 5 at 5:00” and "Chronicle," Lisa Pierpont, editor of Boston Common magazine, Bree Sison of WBZ “This Morning,” Janet Wu, anchor/reporter for WHDH Channel 7. The all-inclusive $30 admission price is not only a front row seat to the afternoon fashion show, set in communal seating to encourage gab and gossip, but also includes: gourmet hors d'oeuvres, (1) cocktail provided by Brockman’s Gin (full cash bar also available), an exclusive “Sparkle VIII” discount giving attendees 15%-20% off at all participating vendors, and a complimentary gift bag filled with goodies galore. A percentage of proceeds from the event will go to Rosie’s Place. Tickets are required and can be purchased by calling Beacon Hill Hotel & Bistro at 617-723-7575 or visiting sparkle8.eventbrite.com. Tickets are non-refundable. This is a 21+ event. 2) Share Our Strength’s Taste of the Nation takes place on Tuesday, June 9, and has a stellar lineup of Chefs and restaurants that will be participating. More than 70 restaurants will join SOS Founder Billy Shore to participate in one of the year’s hottest culinary events. The annual tasting event will feature the city’s top chefs, sommeliers and mixologists united for a cause: making sure all children in this country get the healthy food they need, every day. Proceeds from the event benefit No Kid Hungry’s work to end childhood hunger in America. Led by a distinguished Chef Council, Boston’s culinary tastemakers will provide guests with scrumptious bite-size fare, craft cocktails, and desserts of all kinds. One in five children in this country struggles with hunger, including more than 270,000 kids in MA. No Kid Hungry is ending childhood hunger in this nation by ensuring that kids start the day with a nutritious breakfast and families learn the skills they need to shop and cook on a budget. 3) On Friday, May 1, Shake Shack® kicked off its 4th Annual Great American Shake Sale benefiting No Kid Hungry®. The Great American Shake Sale is a company-wide cause marketing initiative taking place May 1-31 at all U.S. Shake Shacks (excluding stadiums and airports). The goal is to raise awareness and funds for No Kid Hungry in its effort to end childhood hunger in America, where 1 in 5 children do not have consistent access to adequate food. Thanks to the incredible support of its guests in 2014, Shake Shack surpassed its goal to raise $300,000 by more than $38,000. This year, Shake Shack’s new goal is to raise $350,000. If reached, Shake Shack will achieve the significant milestone of donating a total of $1 million to No Kid Hungry in the four years since the launch of the Great American Shake Sale. Donations to No Kid Hungry help connect children to the healthy food they need through essential nutrition programs like school breakfast, summer meals and classes that educate low-income families on how to cook healthy, affordable foods. Just $2 can provide kids with 20 meals. If Shake Shack reaches its goal to raise $350,000 this year, that’s 3.5 million additional meals for hungry children in America. 4) Now in its 18th year, Chefs in Shorts brings together a group of the area’s top culinary talents who fire up the grills and create their favorite dishes during this expansive outdoor, summer-in-the-city barbeque hosted at the Seaport World Trade Center. Join some of Boston’s best chefs for an evening of grill-offs, desserts, beer, wine and fun to benefit Future Chefs, a local nonprofit focused on first careers in the culinary arts. TICKETS: Tickets now available online at: https://chefsinshorts.eventbrite.com. MORE INFO: This event is 21+ and requires proper identification. 5) Leave the cooking to Prezza this Mother’s Day, Sunday, May 10, from 4pm-9pm, and treat her to an escape in Italy – sans passport. In addition to serving the regular menu focused on Old World-style cuisine, Owner & Chef Anthony Caturano will be dishing out seven specials at his famed North End eatery. To start, there are Fried Clams (fennel and caper remoulade sauce - $16), Eggplant Parmigiano (basil, roasted tomato and mozzarella - $14) and Buffalo Mozzarella (tomato, basil and aged balsamic - $16). For the pasta course, Chef Caturano will serve up Gnocchi (San Marzano tomatoes and basil - $18) and Linguine (clams, ramps and butter - $18). There also will be two special entrees, Veal Saltimbocca (crispy prosciutto, sage, roasted potatoes and broccoli rabe - $26) and Chicken Parmigiano (tagliatelle and San Marzano tomatoes - $26). When was the first Sake brewery constructed in North America? As I previously wrote, in An Expanded History of Sake Brewing in the U.S., the first Sake brewery in the U.S. started producing Sake in 1902, though there had been an earlier idea, which did not come to fruition, to start a brewery in Chicago in 1892. Was the U.S. the first country in North America with a Sake brewery? My latest research indicates there was likely a Sake brewery in British Columbia (B.C.) that predates the U.S. one, though the answer is not as simple as that. As Japanese immigrants came to the U.S. in the 1880s, some of the first Japanese immigrants to Western Canada arrived around 1889, to the coal mines in Cumberland. Others would soon follow, often coming to work on the railroads, in fisheries or the logging industry. Vancouver became the center of the Japanese community. By 1900, there were about 4600 Japanese in B.C. and by 1911, there would be about 8600, far smaller numbers than immigrated to Hawaii or California. And where there were Japanese immigrants, there was Sake. Ryoji Onodera, who would become a significant figure in Sake brewing in B.C., was born in 1854 in the Miyagi Prefecture of Japan. In 1875, he married Uino Oikawa, whose father was a businessman involved in the transport industry, and he was subsequently adopted into their family. Oikawa became a successful businessman in his own right and, in time, was intrigued with reports of salmon fishing in Vancouver. Seeing a business opportunity, he traveled to Vancouver in August 1896. He liked what he found, returned to Japan to gain more experience and acquire some workers, and then went back to Vancouver in 1897. For the next couple years, he traveled back and forth between Vancouver and Japan. In May 1899, he brought to Vancouver with him a Sake brewer and a cooper. Oikawa's plans were to produce Sake, soy sauce and miso for the Japanese community in and around Vancouver. The copper would use cottonwood trees to construct barrels. Enough Sake was soon produced that some could be traded or sold to other local residents, much of it traded for dog salmon. For white fishermen, dog salmon were considered relatively worthless, but it was a commodity of value to the Japanese. Interestingly, two types of Sake were produced, a clear Sake to trade with white fishermen for the salmon, and a type of nigori, a cloudy Sake, for the Japanese. This large-scale Sake production, with an expert brewer and cooper, predates the first U.S. brewery in Berkeley. However, it must be noted that Oikawa's operation was illegal as he didn't possess a license to brew alcohol. There had been illegal Sake operations in the U.S. too, though none approached the large scale of Oikawa's operations. Eventually, in early 1901, Oikawa and about thirty others relocated to Don Island, which was previously uninhabited and located on the Frasier River, though the island soon became known as Oikawa-jima. One of the first buildings they constructed on the island was a Sake brewery, showing the great importance of Sake to their community. By 1910, much of the population was seasonal, following the fishing seasons, and one of the only year round activities was the production of Sake and soy sauce. Sake production had grown, and that would lead to its doom. Despite Oikawa's Sake brewery being illegal, the authorities had never bothered it because they saw it as something too small scale for their attention, as well as something that was largely directed at the Japanese community. However, after receiving some complaints, possibly from competitors, the local police felt compelled to act. In September 1911, the police raided and shut down the brewery. .
Much of the above information is based, in part, on a historical novel that was written by Jiro Nitta and published in 1979. Though some of the book is fictional, it is strongly rooted in fact, and based on numerous unpublished sources, including an autobiography by Oikawa. Additional sources have verified much of the information with the novel, and noted where there were fictional aspects. The general information about the early Sake brewing appears to be largely accurate, and supported by other sources. For example, Buck Suzuki, who was born into the Don Island community, verified that Sake brewers were brought from Japan and that the operation was on a large scale. He noted that the rice for the Sake was stored in huge barrels while thousands of gallons of Sake were produced. He also mentions that the police did raid the brewery, using axes to break open the barrels. Another man who lived in the area during that time, Albert Olson, stated that the Sake was being sold for $2 per gallon, or 35 cents per bottle. The first legal Sake brewery in British Columbia likely originated in 1923. A July 1923 newspaper noted that the Vancouver Malt & Sake Brewing Co., Ltd, has received approval to brew Sake. The brewery was founded by Koichiro Sanmiya, a Japanese businessman who came to Vancouver in 1907. He also owned a hotel restaurant, an import/export business, and a Japanese -language newspaper. At the time, his license for the Sake brewery was the only distiller's license in British Columbia so it was clear there were no other Sake breweries in the region. Unfortunately, I haven't been able to uncover much else about this brewery, except for its role in a lawsuit concerning a non-compete covenant. Apparently the brewery possessed a full alcohol license but only ever brewed Sake. There was another company in the area, Vancouver Brewers Ltd., which also brewed only beer. Around 1927, Vancouver Malt assigned its license, for $15,000, to Vancouver Breweries, through the Henry Reifel Pacific Beer Agency, except it retained their right to brew Sake. As part of their agreement, Vancouver Malt agreed not to brew or sell any beer for fifteen years. Around 1933, the Associated Breweries of Canada, Ltd. acquired the Vancouver Malt & Sake Brewing Co., Ltd. but apparently failed to do their due diligence. After the acquisition, they realized they couldn't brew beer at their new brewery because of the non-compete, but did so anyways. An injunction was filed against them, which they battled in the courts for about two years. Ultimately, the courts voided the covenant, finding it was too wide in application and was not considered reasonably necessary. Associated Breweries were thus allowed to produce beer at the former Vancouver Malt, though I have been unable to determine when the brewery actually stopped producing Sake. Today, there are two Sake breweries in B.C., including the Artisan Sake Maker, owned by Masa Shiroki, which was founded in 2007 on Granville Island. The other is the YK3 Sake Producer, which was founded in 2013, taking over the the former Nipro Sake Brewery in Richmond. I'm not sure if there were ever any other Sake breweries in British Columbia, but I am continuing my research and will update you all if I find anything new. The Pecan is the only tree nut that is native to the U.S., with Georgia leading the country in pecan production, and has for over one hundred years. The U.S. produces more than 80% of the world's pecans and 14 states grow pecans, though most are from Georgia, New Mexico and Texas. In 2012, the U.S. produced about 303 million pounds of pecans, with about 100 million from Georgia, 65 million from New Mexico and 55 million from Texas. There are over 500 varieties of pecan, many named for Native American peoples, though only 3 are actually commonly available. Pecans are also nutritious, and "...are linked to lowering cholesterol, improving heart health, lowering cancer risk and managing weight. Pecans specifically contain 3 grams dietary fiber and over 19 vitamins and minerals including but not limited to vitamin A, vitamin E, calcium, potassium and zinc. Pecans are also a good source of oleic acid, vitamin B1, thiamin, magnesium and protein, all this at only 196 calories per one once serving (about a handful)." You can find more specifics on the studies supporting these health benefits here. One of my favorite pies is pecan pie, though I enjoy pecans in a number of other dishes as well, from pecan-crusted fish to bourbon bread pudding with pecans. I recently received a media sample of Elliot Halves Pecans from Pearson Farm, located in Fort Valley, Georgia, and knew that I needed to enjoy them, at the very least, in a pecan pie. The Pearson Farm was established back in 1885, when Moses Winlock “Lockie” Pearson and his wife, Cornelia Emory “Emma” planted the first peach trees and soon after started growing pecans too. Today, the family continues growing peaches and pecans. Their pecans are generally harvested from October to December, though with proper storage you can keep your pecans year-round. You can refrigerate your pecans for 9-10 months, though if you freeze them, they can last up to two years. Pearson Farm sells three varieties of pecans, both in-shell and shelled. Their varieties include Mammoth Halves, Schley (or Papershell Pecans), and Elliot Pecans. You can get shelled pecans as halves or chopped. I received one pound of Elliot Halves ($11), and this variety is small but plump, round and delicious. They can be used in cooking or snacking on their own. This variety was first discovered Florida in the 1920s, and they are more rare, especially as their harvests can be sporadic. I enjoyed some of the pecans on their own, and they provided a fine, nutty taste with a firm texture. They seemed fresher than some of the pecans I've commonly bought at the local store, and their price is very reasonable considering the quality of the pecans. Marilyn, my sister-in-law, makes one of my favorite Pecan Pies, which she usually makes for either Thanksgiving or Christmas (or both holidays if I'm lucky). I persuaded her to make one for Easter, using the Elliot pecans and it came out excellent. The pecans had a prominent savory flavor, and seemed to enhance the pie even more than usual. During the week after Easter, I savored a few more pieces of the pecan pie, heating it up and adding a little vanilla ice cream. You can buy the usual commercial pecans at your local supermarket, or you can order some higher quality pecans from Pearson Farm. I think you would enjoy the Pearson pecans much better. I don't hide the fact that I generally dislike beer, primarily because I don't like the taste of hops. It would be simple for me to write off beer, to never again sample or taste it. I have seen other people do exactly that with other beverages. There are people who state they dislike Chardonnay or Champagne, and won't ever drink it. They refuse to even take a sip, convinced they will hate it, sure of their position. I refuse though to take such a position. Why? Because I understand the simple fact that beverages are diverse, that they come in a multitude of flavors and styles, types and tastes. I know that even if I dislike 99% of the beers on the market, that still leaves 1% which I may enjoy. I refuse to stop sampling and tasting beers even though I will dislike most of them. For a time, I disliked most Cabernet Franc wines I tasted, as I disliked the green/vegetal taste I found in those wines. However, I persevered, continuing to seek out Cabernet Franc wines and eventually found a good number of them that I did enjoy. While I was working this weekend at the Beacon Hill Wine & Gourmet in Melrose, I noticed a new beer that we were carrying, the Not Your Father's Root Beer, produced by the Small Town Brewery in Illinois. I like root beer so this intrigued me, an Ale with spices that supposedly made it taste like root beer. I decided to take a chance on it, and bought a 6-pack, despite not knowing whether I would like it or not. Small Town Brewery seems to make three version of this product, varying by their alcohol content, and including 5.9%, 10.7%, and 19.5%. The latter two versions are limited editions and primarily available in Illinois. It is apparently made with ingredients such as vanilla bean and honey from Switzerland, though the brewery website doesn't discuss the ingredients. I cracked open a bottle that evening and was impressed with its taste, which definitely reminded me of an old style root beer. It was creamy and sweet, with tastes of vanilla, caramel and spices like sassafras. There is a hint of alcohol in the taste, but it doesn't taste like a normal beer. It seems more like a fine soda, with a bit of a kick to it. I drank a few of these that night, and each one went down easily. Its level of sweetness would stop you from drinking too many of these at one time, but on a hot summer day, a couple cold bottles would satisfy. I'm betting this beer will end up on my end of the year Favorite lists. The point of this story is to illustrate that no one should write off an entire category of drinks. Their diversity means you are likely to find something you will enjoy. By denying an entire category, you shut yourself off to a myriad of possibilities, and life is too short to do that. Be open to sampling everything you can, taking a chance on something new and different. Experience all that life has to offer and I'm sure your life will be richer for it.